AMMA members have access to the full range of AMMA services including Workplace Relations Consultancy; Training and Development; Policy and Advocacy; and support on key Workforce matters including; Diversity and Inclusion via Australian Women in Resources Alliance (AWRA), Workforce Development and Mental Health and Wellness. Impactful training and development – national leader in training tailored to suit your audience and location. 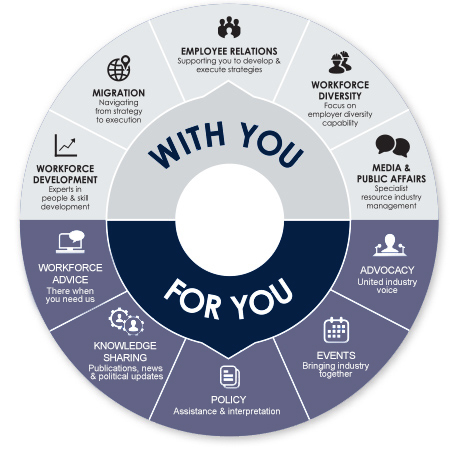 With the majority of resources and energy employers in Australia being AMMA members, you have access to a powerful network of leadership, representation, experience, innovation and influence. As an AMMA member you have access to a vast range of services and support. Our team has experience and knowledge across a broad range of industries and works to both support our members in their individual business objectives, as well as collectively building the success of the resources industry. Understand the full range of AMMA services and support immediately available to you. Click HERE to download a copy of our membership document and share within your organisation. Let AMMA know if there is an opportunity to profile your organisation and for a leader within your organisation to speak at one of our events. Join an AMMA Special Interest Group to network and discuss issues that directly affect your industry. Remember, our friendly team members are always on hand to help – it’s good to know you’re not on your own.